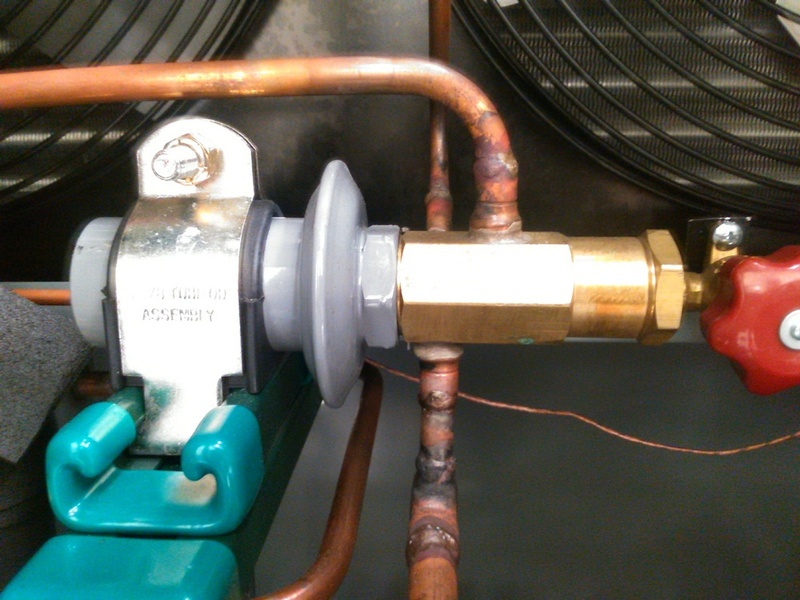 Hot gas bypass valves are a simple and very effective way to add a false load on an evaporator coil. What is a false load you ask. Well, as we have learned in the past, refrigerant pressures are directly related to the ambient temperature surrounding them. For example, if the return air in a system is close to set point, regardless of what that set point is, the suction pressure will be lower than if the return air was five degrees above set point, correct? By adding hot gas from the discharge line into the evaporator, we can increase the evaporator pressure and temperature. Because this load is not put there by heat from the return air, the load is referred to as false. Hot gas bypass valves can be used in many different applications where the load on the evaporator varies, from residential, to server rooms, to process cooling equipment. Using a hot gas bypass valve can also prevent short cycling of a compressor and prevent evaporator freezing in low load conditions. As a space or process temperature reaches set point, hot gas can be added to the evaporator to raise its temperature. With increased evaporator temperature, set point will take longer to achieve, thus increasing compressor run times all the while preventing evaporator freeze up. Keep in mind though, it is normal in some applications for evaporators to freeze during normal operation, like in low temperature refrigeration applications. A large lecture hall is filled with people, the load will be high and the system will most likely run at 100% capacity to cool the space. During an intermission, people leave for a break, the load drops and the room approaches set point. The hot gas bypass valve opens putting a false load on the evaporator, since the evaporator temperature has been increased, the supply air serving the lecture hall will also be increased preventing set point to be reached. As people re-enter the hall, a true load will increase evaporator temperature and the hot gas bypass will close. This prevents compressor short cycling with varying loads, compressor stops and starts are a major factor in compressor failure over time. Let's take a look at how the valve operates. There are mechanical valves and electrical valves. The mechanical hot gas bypass valve (HGB) is fed discharge gas (hot gas) teed off from the discharge line. The output of the valve is directly piped to the inlet of the evaporator after the TX valve. In some situations, where multiple evaporators are used, it may be piped into the suction line. There are some disadvantages to this though, like improper oil return to the compressor. They are adjusted manually, the Sporlan ADRSE-2, from the video below is adjusted using an Allen key. Adjusting the valve inwards will allow more hot gas to flow through the valve, backing out the adjustment will allow less hot gas to flow through the valve. When setting up the valve, you may need to simulate a low load condition. For instance, if you want to maintain a suction pressure of 60 psi in the evaporator, perform the following steps. Simulate a low load condition, allow the pressure to drop below 60 psi. Starting with the hot gas adjustment backed all the way out, slowly begin to adjust the valve inwards until the flow of hot gas raises the evaporator pressure to the desired setting of 60 psi. The valve will maintain that set point by monitoring evaporator pressure and adding hot gas as needed. The electronic hot gas bypass valve (EHGB) uses the same concept as it's mechanical counter part but operates a little differently. For example, the Sporlan SDR series uses a 12 VDC stepper motor. A controller must be used in conjunction with the valve and be capable of monitoring temperature and pressure. The electronic set up can be used for more accurate control of evaporator temperature. The electronic valve can also be piped to the evaporator inlet or the suction line. You will need an interface to set up this valve, an Allen key will not suffice. Generally speaking, there are three ways of piping in a hot gas bypass line. 1. Evaporator inlet with a distributor, with this method, the hot gas bypass line shall be piped after the TX valve but before the distributor. An auxiliary side connection (ASC) should be used, the ASC prevents TX valve operating issues as hot gas flows into the evaportor. 2. Evaporator inlet with no distributor, this configuration follows the same principles as above. 3. Directly into the suction line, this configuration can be employed when multiple evaporators are used. It should be noted that oil return to the compressor could be an issue due to refrigerant bypassing the evaporator coil. Not all valves are created equal, refer to manufacturer specifications and installation and service literature before choosing or setting up a hot gas bypass valve.